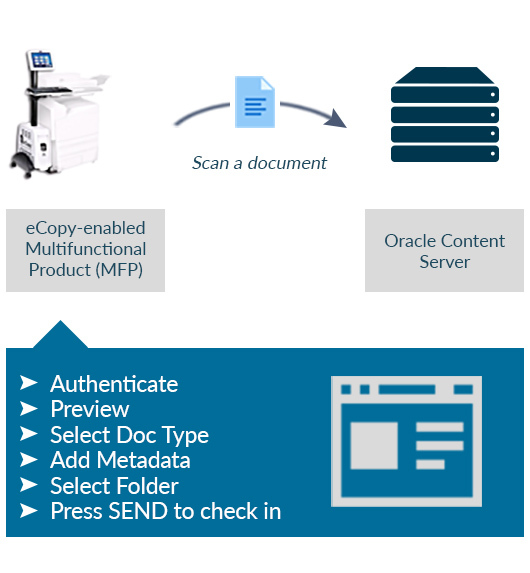 The Oracle WebCenter Content Connector for eCopy ShareScan allows you to quickly convert hard copy documents into digital files and to send them to Oracle Content Server folders and document workflows. Oracle users can manage paper documents with more efficiency and fewer errors while supporting document lifecycle management and existing business processes. To see if your MFP is eCopy enabled, check the eCopy ShareScan Supported Device Lists on Nuance website.